Wiss 6'' Pocket Scissors features blades with a flat pattern with double blunts points. Wiss Pocket scissors are made of fully nickel plated hot drop-forged solid steel, and a ring handle. Wiss 5'' electrician scissors feature a double stripping notch for 19 gauge (0.035) and 23 gauge (0.022) wire, and is serrated along entire bottom blade with a scraper and file on back edge of blade. Wiss electrician scissors are made of fully nickel. Wiss 5'' electrician scissors feature a double stripping notch for 19 gauge (0.035) and 23 gauge (0.022) wire, and a serrated bottom blade with a scraper and file on the back edge of the blade. Wiss electrician scissors feature a double stripping notch for 19 gauge (0.035) and 23 gauge (0.022) wire, and a serrated bottom blade with a scraper and file on the back edge of the blade. Wiss 8 1/2'' industrial shears are used extensively in the poultry industry, and feature a new enlarged lower ring for added comfort, and a patented Set-Easy pivot. 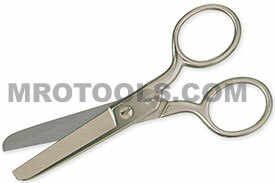 Wiss 9 1/4'' industrial shears are made for professional dressmaker and industrial use. Wiss industrial shears feature a patented Set-Easy pivot and precision ground blades for sharper cutting edges & longer blade life. Wiss 8'' poultry processing shears are used extensively in the poultry industry, and feature a new enlarged lower ring for added comfort, and a patented Set-Easy pivot. Wiss industrial shears are forged from Nickel-plated high carbon steel. Wiss 6 1/4'' bent trimmers industrial shears professional dressmaker and industrial use finest quality cutlery steel hot drop-forged nickel-plated blades patented Set-Easy pivot precision ground blades for sharper cutting edges & longer blade life. Wiss 7 1/8'' bent trimmers industrial shears professional dressmaker and industrial use finest quality cutlery steel hot drop-forged nickel-plated blades patented Set-Easy pivot precision ground blades for sharper cutting edges & longer blade life. Wiss 8 1/8'' bent trimmers industrial shears professional dressmaker and industrial use finest quality cutlery steel hot drop-forged nickel-plated blades patented Set-Easy pivot precision ground blades for sharper cutting edges & longer blade life. Wiss 5'' electronics and filament scissors feature a coil spring handle that opens blades after each cut. Wiss electronics scissors are made from hot drop-forged solid steel, polished blades, and a black handle. Wiss 8'' pinking shear pinks and cuts in one operation, saving time and labor. Wiss pinking shear features a sawtooth blade design reduces the time spent finishing edges on fabrics. Wiss 8'' kitchen shears cut a variety of materials including twine, rope, cardboard, and light metal. Wiss kitchen snips are ideal for many miscellaneous jobs in and around the home, and feature one serrated blade, and a black baked enamel handle. Wiss 8'' rug shears for hooked and candlewick rugs feature a black baked enamel handle, and are made of nickel-plated hot drop-forged solid steel blades with sharp points. Wiss 4 3/4'' industrial thread nippers, sharp points feature a self-opening spring-action assures fast, effortless cutting. Wiss thread nippers are made of quality fully nickel-plated hot drop-forged cutlery steel. Wiss 4 5/8'' industrial thread nippers, blunt points feature a self-opening spring-action assures fast, effortless cutting. Wiss thread nippers are made of quality fully nickel-plated hot drop-forged cutlery steel. Wiss 10'' all purpose scissors feature a titanium coating that is 3x harder than steel for longer life, and precision ground blades for smooth cutting. Wiss 10'' full metal scissors feature a titanium coating that is 3x harder than steel for longer life, and precision ground blades for smooth cutting. Wiss 10'' industrial shear is ideal for cutting carpet, synthetic fibers & composite materials. Wiss shears feature one blade ground to knife edge for faster, cleaner cutting, precision ground blades for sharper cutting edges & longer blade life. Wiss 10'' industrial shear features blade tips that are rounded for extra protection, precision ground blades for sharper cutting edges & longer blade life,and red cushion grip handle rings designed to comfortably fit users hands. Wiss 12'' industrial shear with bent handle and knife edge is ideal for cutting carpet, synthetic fibers & composite materials. Wiss 10'' industrial shear with a bent handle is commonly used in cutting fabrics, upholstery, & composite materials. Wiss shears feature precision ground blades for sharper cutting edges & longer blade life. Wiss 10'' industrial shear with bent handle for left hand is commonly used in cutting fabrics, upholstery, & composite materials. Wiss 10'' industrial shear with bent handle and cushion grip is commonly used in cutting fabrics, upholstery, & composite materials. Wiss 10'' industrial shear with bent handle and blunt safety point Blades feature Blade tips that are rounded for extra protection and precision ground blades for sharper cutting edges & longer blade life.